There have been reports this week of a major silver eel kill on the River Erne in Ballyshannon, Co Donegal. It is understood that these eels were killed trying to pass the hydroelectric stations on the lower reaches of this river. The photo below was sent to us by a concerned angler on the river, who wants to remain anonymous. Silver eels are currently on their autumn spawning migration to the Saragossa Sea. The migration has been stimulated by current floods in the river, Storm Ophelia and the current new moon. We are also currently finding dead silver eels on the River Shannon. Ireland’s eel management plan has been designed to protect the interests of the ESB, and not those of the European eel and the traditional fishermen who used to fish for it. The European Eel Anguilla anguilla is currently listed by the IUCN as a critically endangered species. Hydroelectric power stations like Cliff and Cathaleen’s Fall on the Lower River River are one of the most significant threats to this species. Indeed, hydroelectric turbines have been shown to be the largest cause of eel mortality in Sweden, and this may also be true for Ireland. It is noted that the turbine killed eels found below Irish hydroelectric stations each year represent only a tiny percentage of the overall numbers killed. Most are just washed away or eaten by predators. However to find so many at Ballyshannon yesterday indicates that major eel kill occurred here. 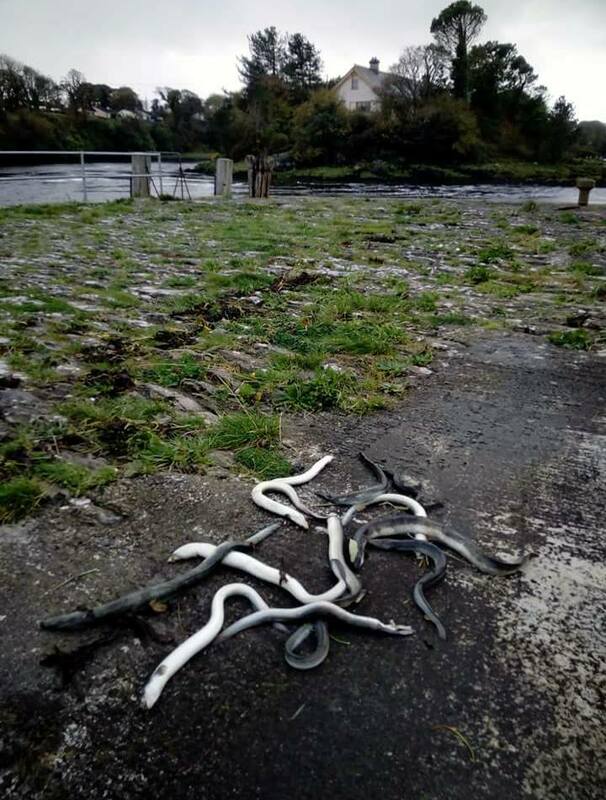 Reports of large numbers of turbine killed #eels below Cathleen’s Fall hydroelectric station on River Erne – photo from Mall Quay on 18 October 2017. In 2014 the ESB admitted to killing almost 6 tonnes of eels at their two hydroelectric stations on the River Erne – which may represent 10,000+ silver eels. But this figure is likely to be significant underestimate – a dead or injured eel is swept down a tailrace as rapidly as a live one and are not easily discerned using any currently available tagging or sonar technologies. More worryingly there is increasing evidence to suggest that the impact of ESB hydro-power impacts on eels is not being accounted for accurately. But even the ESB’s own estimates (25,000+ silver eel mortalities per year on the Shannon and Erne) do not consider the fact that many more eels die long after passage through turbines as a result of sub-lethal injuries. It’s a long way across the Atlantic ocean to the Sargasso Sea, and a fish has to be very fit and healthy to complete this journey and spawn successfully. Overall it is clear that Ireland’s eel management plan has been designed to protect the interests of the ESB, and not those of the European eel and the traditional fishermen who used to fish for it. This is the second major eel kill to occur here due to hydro-power operations in the last four years. In 2014 the ESB let 336,000 elvers (minimum – number reported by ESB) die at their hydroelectric station on the Erne in what could only be described as negligence. The ESB were never prosecuted – and no compensatory restocking ever took place. The authorities only asked them to bring their elver traps up to the standard they should have been at anyway (and silver eels were purchased from the River Bann fishery and released). However, the ecological loss of the elvers to the Erne lakes and tributaries was never mitigated for. See our video below of the Lower River Erne taken during June 2016. The ESB hydroelectric dams at Cathaleen’s Fall in Ballyshannon Co Donegal and Cliff (near Beelick Co Fermanagh) are featured in this video. Having two dams on the Lower River Erne presents a challenge for addressing the fish migration problems.